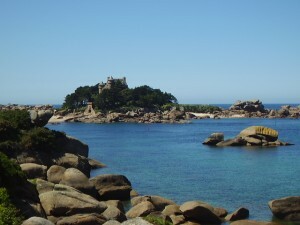 Cotes D’Armor is one of the 4 departments that makes up Brittany. Up until 1990 this department was known as Cotes du Nord. Cotes D’Armor (Ar mor being Breton for the sea) has its coastline bordering the English Channel and has endless coves of sandy beaches giving way to granite cliffs. Some of the most spectacular of Cote D’Armor’s coastline is the Pink Granite Coastline around Ploumanac’h, famed for its unusual rock formations, which are quite literally pink in colour. Further along the coast the enchanting fine sandy beach of Pleneuf Val Andre can be found. The beautiful seaside town retains its 19th century charm with promanade and mix of seafront villas. Cote D’Amors administrative capital is St Brieuc, with Le port du Légué, providing a marina for sail boats. Those living in the department of Cotes D’Armor are known as Costarmoricains. Brittany became a favourite holiday destination from the mid 19th century, particularly with Parisians. Now popular with British holiday makers too, with low cost airlines flying into Dinard and ferry travel to Roscoff and St Malo. Many have been captivated by the slower pace of life, the warm and friendly ambiance, the excellent road network and quaint villages and have now made Brittany their home. No wonder Cotes d’Armor is a popular destination.